In a 2010 article from Stanford School of Medicine, research lead by Mark Chao and Ravindra Majet details interesting insight into the machinations of cancer cells. The researchers and their team discovered that many cancer cells actually carry the wellspring of their own ruination, this is in the form of a protein, calreticulin (CRT), an 'eat me' signal on the cell surface of cancer cells that signals circulating immune cells to engulf and digest them. So how come cancer cells are not destroyed efficiently by microphages? Now this is where it starts to get interesting, get this, cancer being the genius that it is also produces separate 'don't eat' me signals in the form of CD47 proteins on cancer cell surfaces creating a process that works to counteract the 'eat me' (CRT) signals. Previous studies by Stanford scientists involved the characterization of the function of the 'don't eat me' (CD47) protein in cancer cells, through the studies, they established that an anti body that works to block CD47 could be a powerful anti-cancer tool in cancer therapy. They were able to illustrate through their research that anti-CD47 antibodies could eliminate disease in mice transplanted with human myeloid leukemia and also heal a grand proportion of mice with human non-Hodgkins Lymphoma when combined with a second antibody. Although fascinating, the results left the researchers astonished and with a few unanswered questions. This was partly due to the fact that the researchers knew that, CD47 can be found on many cells in the body, yet those cells are unaffected by the CD47 antibody; this observation mystified them. Research also went on to show that normal cell populations do not display CRT and therefore are not expended when they are subjected to CD47 blocking- antibodies. This research also brought up another question that resonated with me as I was reading this article. That question is whether simply blocking CD47 expression in cancer cells would be sufficient to bring on cancer cell destruction. It turns out that blocking the CD47- 'don't eat me' cells works to kill cancer cells because cancers like leukemias, lymphomas, and many solid tumors also display CRT-the 'eat me' signal. Interestingly, the most aggressive cancers were found to be the ones producing the most CRT, raising the hope that some of the worst cancers may be the ones most vulnerable to therapies that target CD47 and CRT in particular. This observation also suggests that the immune system works hard to try and get rid of these malignant cancer cells, the high concentration of CRT cells is a testimony to this. This process in itself raised other questions in the study too, knowing cancer and its ability to evolve, why would cancer cells carry a protein that invites their own demise, and perhaps most importantly, why would cancer cells then go on to make these proteins in large quantities? 'Is CRT part of the cell's regulatory system that cancers have learnt to work around?' Well, the article suggests that because normal cells, when damaged produce and expose CRT proteins in order to get eaten and destroyed as part of the immune of keeping cells under control, CRT expression may be a marker of this process, requiring cancer cells to make more CD47 to avoid getting eaten by microphages. In other words, the researchers seem to be saying that the over production of CRT maybe a result of the immune system working on cancer cells and not the other way round. After Dr. Islas' detailed study of the hallmarks of cancer with the class, it is not surprising that cancer cells maybe using this phenomenon to their advantage. According to the article on the hallmarks of cancer by Hanahan and Weinberg, we know that cancer cells perpetuate their existence by evading immune destruction and in this case, they do so by ensuring that they produce enough CD47 to cancel out the effects of the CRT proteins which make them edible to microphages, illustrating just how innovative cancer cells can be. I must say that I agree with Chao's and Majet's conclusion because of the clean and logical manner in which they present their arguments, however, I would agree with it even more, if they had included some processed data and figures in the article up on the Stanford website to back it all up. After learning about the hallmarks of cancer cells it comes as no surprise how cancer cells often transform and work their way through hurdles which could lead to their ultimate demise. In this case, cancer cells chose to say 'don't eat me' to avoid apoptosis via the immune system. Secondly, as interesting as this article was, it also left me longing to know more. I wonder if the over production of CRT may have additional advantages for cancer cells, besides bringing on the onset of CD47 proteins. Is cancer already one step ahead of us, using CRT to its advantage? This would be an interesting area of exploration. I also have a theory that perhaps, if we could find a way of suppressing excessive CRT signaling via the immune system, we could then trick both the immune system and the cancer cell in a sense, and we could then somehow rewire the immune system's pathway of getting rid of tumors(if at all possible). This way, we would introduce an element of surprise into the equation that could then work to confuse the cancer cell, in this case, the advantage would be that we would have the upper hand because we would be able to manipulate the immune system to find other pathways of destroying the same tumor cells. This would be a dynamic approach to dealing with cancer. I believe that because cancer is dynamic, our methods of treating it should be dynamic as well. 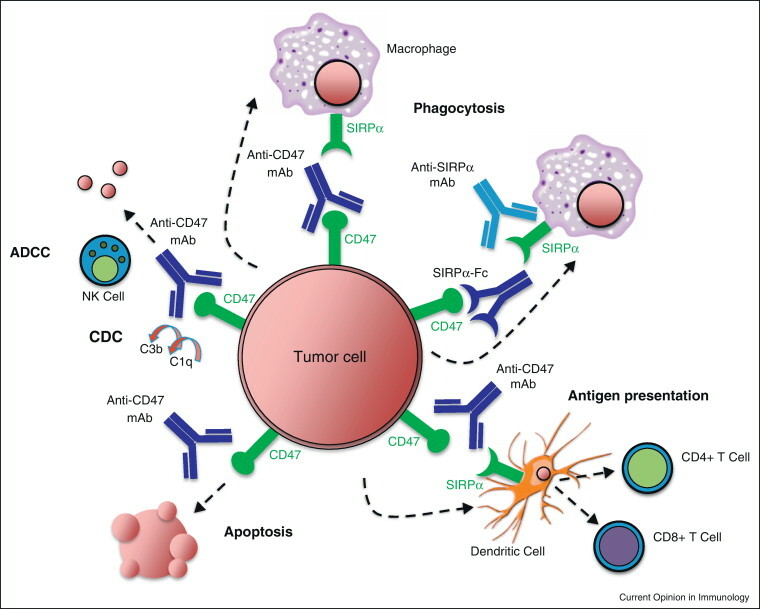 The diagram below from a study on: The CD47–SIRPα pathway in cancer immune evasion and potential therapeutic implications shows how anti-CD47 mechanisms to stop cancer cells from evading immune system destruction. This diagram deals with similar ideas as those I discussed above when it comes to repressing the progression of cancer cells. Figure 1. Mechanisms of targeting the CD47–SIRPα pathway in cancer. Therapeutic targeting of the CD47–SIRPα pathway can cause elimination of cancer cells through multiple mechanisms. First, inhibition of the CD47–SIRPα interaction with a blocking anti-CD47 antibody, a blocking anti-SIRPα antibody, or a recombinant SIRPα protein (depicted here as a bivalent Fc-fusion protein) leads to phagocytic uptake of tumor cells by macrophages. Second, an anti-CD47 antibody can eliminate tumor cells through traditional antibody Fc-dependent mechanisms including NK cell-mediated ADCC and CDC. Third, anti-CD47 antibody may directly stimulate apoptosis of tumor cells through a caspase-independent mechanism. Fourth, anti-CD47 antibody may enable phagocytic uptake of tumor cells by DCs and subsequent antigen presentation to CD4 and CD8T cells, thereby stimulating an anti-tumor adaptive immune response. mAb = monoclonal antibody. I believe that drugs dealing with similar mechanisms and pathways could go a long way to drastically change the way the immune system functions and attacks tumors. They would serve to boost the immune system's functionality in a sense.